House Speaker Michael Madigan, second from right, confers with aides while watching the end of the debate on legislation to raise Illinois' income tax rate. 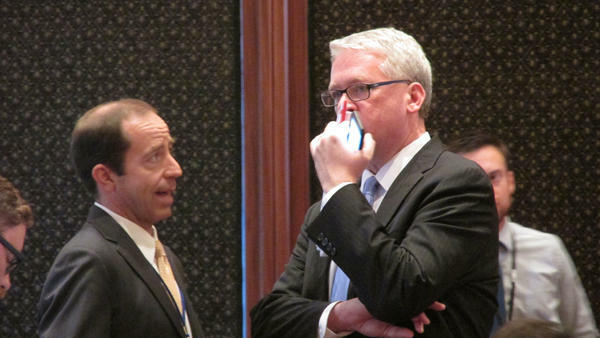 House Minority Leader Jim Durkin, right, confers with colleagues before a vote on an income tax increase. 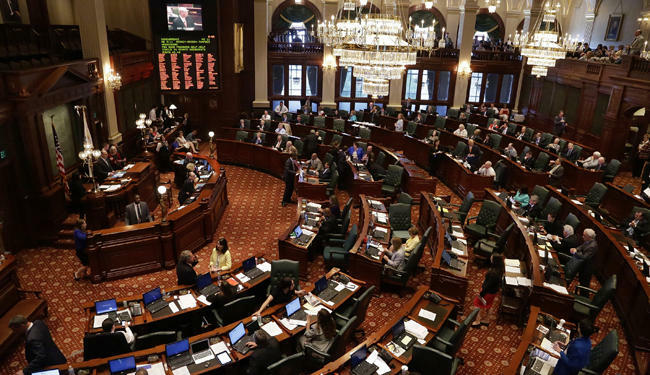 Brian Mackey reports on the bipartisan vote in the Illinois House to increase taxes. TRANSCRIPT: The debate comes after two long years of stalemate over taxes and spending in Illinois government. The basic outlines of the impasse are unchanged: Gov. Rauner has resisted a tax increase until he passes his economic and political agenda — which includes freezing property tax rates and changing how on-the-job injuries are compensated. What's new is that Illinois's situation is going from bad to worse. Road construction projects have been suspended, social service agencies are trying to decide whether to shut down, and the state's credit rating could be lowered to "junk" status at any time. Then there's the growing pile of overdue bills — approaching $15 billion dollars. State Rep. David Harris, a Republican from Arlington Heights, says the interest alone on that debt will cost taxpayers $800 million dollars. Rep. DAVID HARRIS: "We might as well put a pile of $800m there in the center of the floor, light a match to it — because that's what it's worth to the people of the state of Illinois. It's just interest on back bills." Harris grew increasingly animated as he went on. HARRIS: "My friends, let me tell you something very clearly: I was not — I was not — elected as a state legislator to help preside over the financial destruction of this great state." Other Republicans sought to play up their authenticity as conservatives. Rep. TERRI BRYANT: "I love my guns. And I love coal." Rep. Terri Bryant is a Republican from Murphysboro. BRYANT: "As someone who's on the right, who's a fiscal conservative, we can't have vendors — mom and pop places — be asked to do services for the state of Illinois. And then after they perform those services, say, 'Whoops, we don't have the money to pay you, so we're not going to pay you.' And we let them go into bankruptcy?" Bryant also mentioned that her district includes Southern Illinois University Carbondale. Like many state schools, it's had layoffs and declining enrollment as state funding has been drastically reduced during the impasse. "I hope that you will help me to bring my university back to the thriving place that it once was." 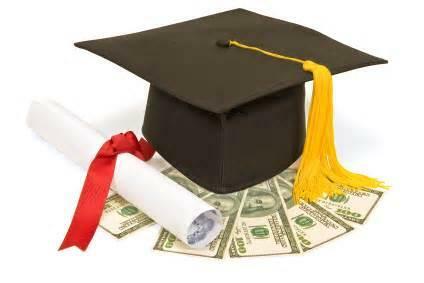 Several Republicans who supported the tax increase have either state universities or large numbers of state employees in their legislative districts. But it still wasn’t an easy position to take. The night before the vote, at least two Republicans found their personal mobile phone numbers had been published online; a flood of angry calls and text messages followed. It’s worth noting that while 15 Republicans supported the tax increase, most opposed it. Republicans like Rep. David McSweeney, from Barrington Hills, say it would hurt businesses and prompt more people to leave Illinois. Despite those objections, the legislation passed on a vote of 72-45. It still has to get through the Senate, which could take it up as early as Monday. But even if it passes there, the ultimate fate of the tax hike is not clear. 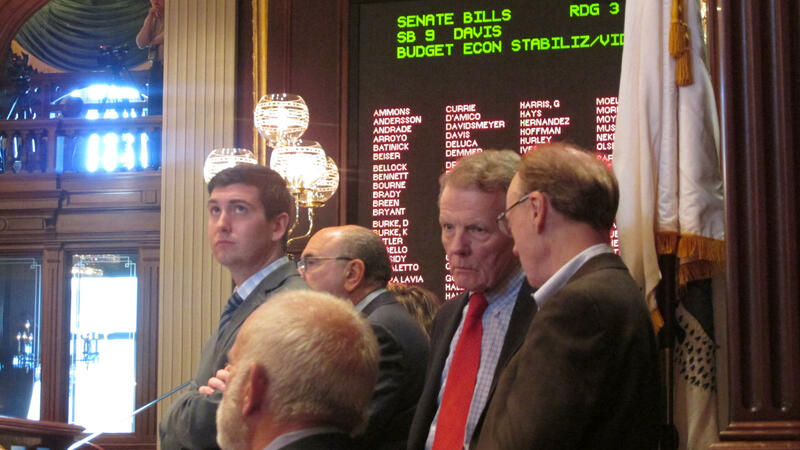 Shortly after the vote, Rauner put out a statement blaming House Speaker Michael Madigan for the tax legislation. He incorrectly characterized it as the "largest tax hike in history" — in fact it's half the percentage increase of the 2011 tax. Rauner also said he would veto it — saying Democrats had failed to send him the so-called reforms he's been looking for. Democrats counter that they're still negotiating with Republicans on the governor's agenda, and will continue to do so.